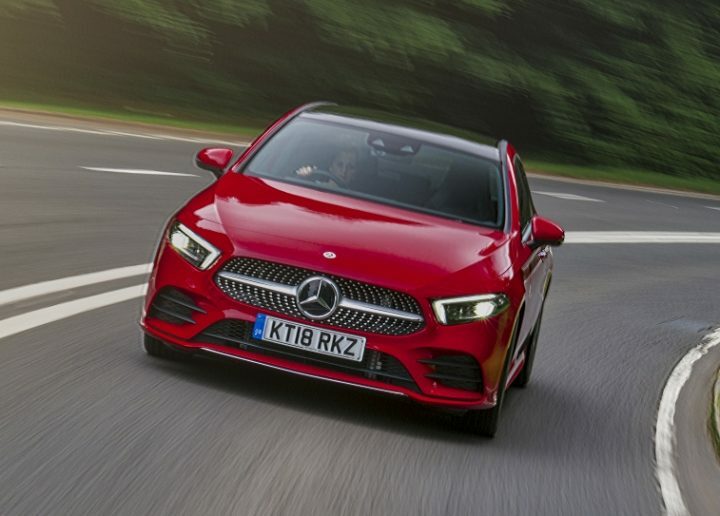 When Mercedes-Benz launch a car, you’d better take notice, particularly if you are looking at the A-Class, writes Robin Roberts. As the oldest car-maker it knows more than a thing or two about design and engineering, and after really establishing its reputation with executive and luxury models it turned its attention to smaller models. It launched the first A-Class in 1997 but the series has steadily evolved and literally grown into the fourth generation which went on sale in 2018. The market changed a lot in those two decades and so has the A-Class, which although the entry-level series, now benefits from many features found on the marque’s flagship S-Class. You’ll not be left wanting even before you drive one. A bewildering choice awaits the potential A-Class buyer with scores of models based on saloon of hatchback bodystyles, four trim levels, ten petrol or diesel engines, 2WD or 4WD and costing from £20,720 to £48,690 as at April 2019. A selection of packs and individual options mean you can personalise the car of your choice so far as your budget permits. 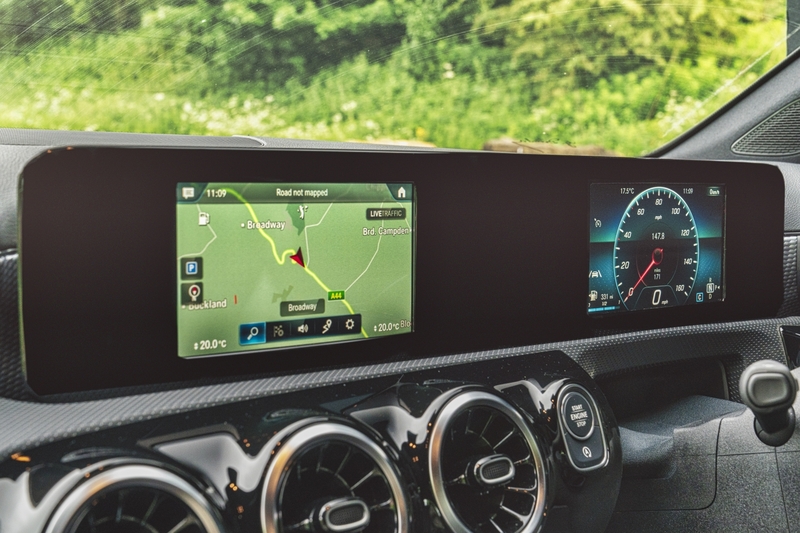 Mercedes-Benz UK had fitted the test car with options including advanced wireless charging and smart–phone connectivity; truly impressive augmented reality navigation overlaying a route with the forward camera view (right) and premium plus pack including twin 10.25in screens, multi-ambient lighting, multibeam LEDs and additional comfort and convenience features which totalled almost £4,600. 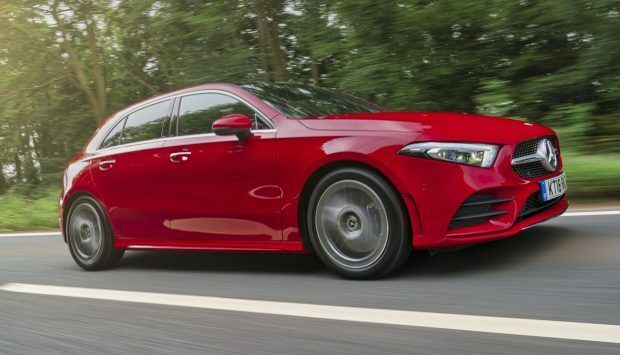 The 2.0 litre four-cylinder engine has a reasonable power band and is smart from standstill, accomplishes overtaking with a big safety margin and cruises in near silence on motorways and main roads. Matched to a similarly refined and seamless seven-speed sequential automatic box with useful sport and paddle manual modes, it is very smooth and we saw almost 55mpg on one long main road run. There is a useful amount of instant power underfoot and on cross-country roads and in town you appreciate its responsiveness but pay a price in fuel consumption, and we saw it plunge to under 30mpg at times so we ended up with a surprisingly high consumption figure. 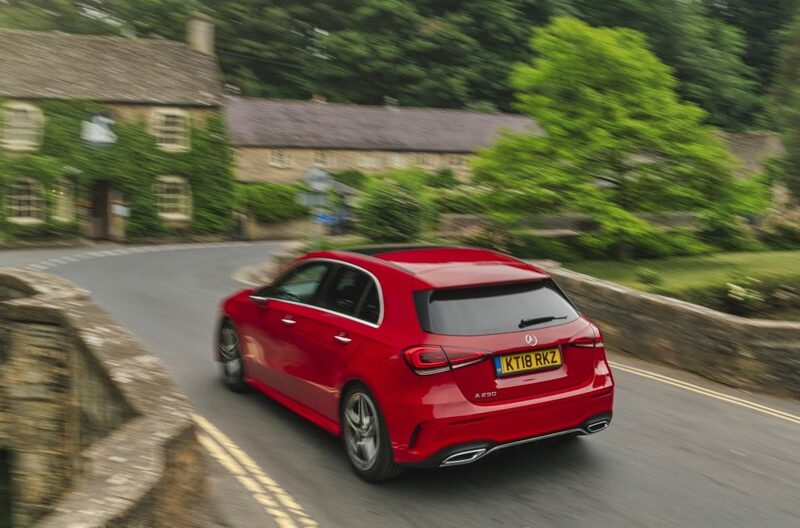 The wide ranging acceleration ability through the gears combined with a delightfully weighted electrically assisted steering, impressive reassuring brakes and its independent suspension endowed the A-Class 250 AMG Line with a Q-car character. It looks like a fairly normal stylish hatchback but drop the accelerator and it unleashes a lot of potential to please and impress. It’s quick, agile, able to take curves with confidence and then slow down without drama in the manner of a sporting hatchback or coupe. 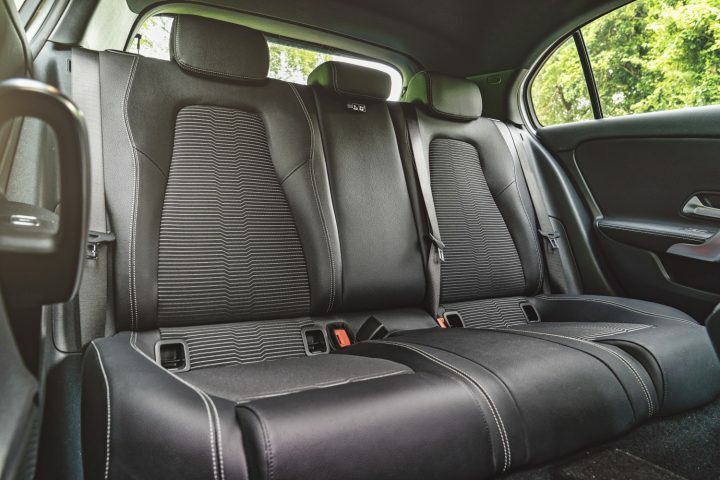 The ride is slightly on the firm side even on the softest of four selectable settings due to the low profile tyres, but it’s generally comfortable thanks to some excellent well shaped and padded seats throughout. You can hear the suspension working away but only the worst bumps are really felt. 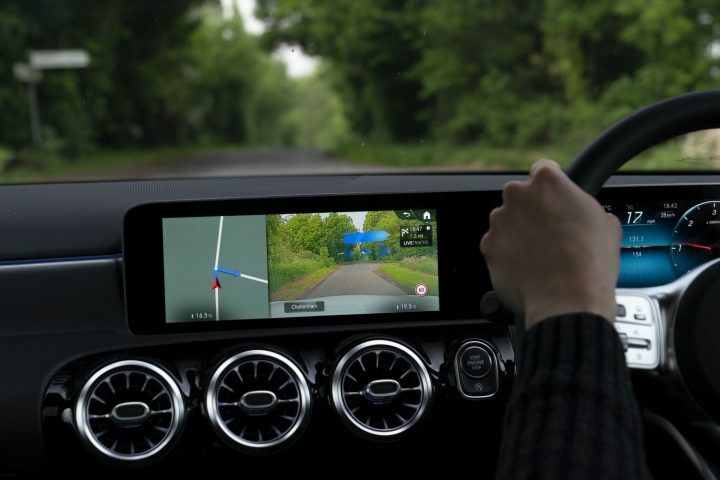 Behind the wheel, the driver is faced with what many would consider is a modern computer screen with twin displays which are changeable and encased in a very slim and attractive panel. 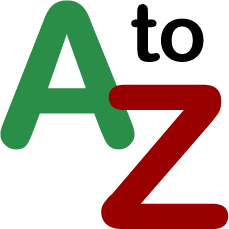 They are clear, easy to use and understand and possibly the best on any car today. A multitude of buttons cover the wheel-spokes, fascia and central console with touch pad as well and these need familiarisation to fully appreciate and function. 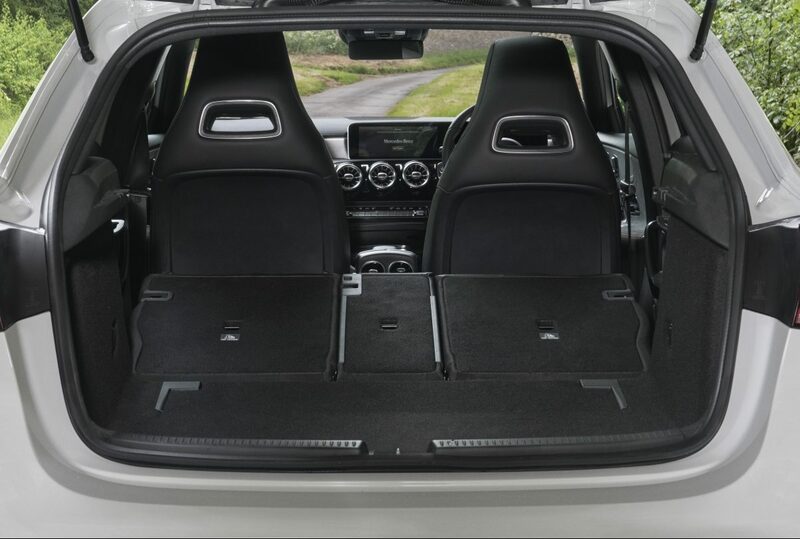 The A-Class heating and ventilation is more straightforward with easily altered outlets, a strong fan and good temperature range, backed up by powered windows and on our test car a near full length glass roof, which gave the interior a very airy atmosphere. Oddments room was not exceptional, however, and the nominal hatched boot capacity was unremarkable, but quickly dropping the back seats transformed it into a good load carrier. Noise levels were generally low apart from rougher roads’ tyre noise, with wind and mechanical sources very well muted. I appreciated the ease of loading into the boot as well as the access for occupants and there was plenty of room throughout, significantly more than the previous generation. The vision was also good, even for those in the back, and there were no complaints from the front with a low waistline, deep windscreen, big wipers and long range, very bright intelligent headlights which also came as an option upgrade and definitely one you’d want to include. The fourth generation A-Class is hardly the Baby-Benz it once was but rather a sophisticated sibling to its stablemates in the range. 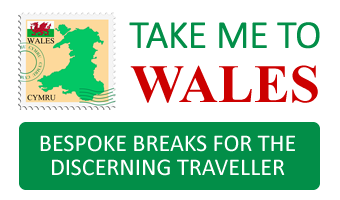 Against: Overall fuel consumption, firm ride even on softest setting, road noise, modest boot with all seats used.